As a general rule, we’re a little suspicious of restaurants professing to offer “gourmet pizzas”. The South Bank’s Gourmet Pizza Co. for example, is notorious for serving up anything but, while attempts to pimp the humble Margherita with luxe ingredients like lobster or salmon have a tendency to arrive as Fire & Stone-esque monstrosities. Imagine our delight, then, to discover Mayfair Pizza Co., an upscale pizza restaurant serving up some intriguing flavour combinations that don’t stray too far into the realms of the outlandish. Upmarket, then, but crucially, the basics of what makes a good pizza haven’t been abandoned in favour of an eye-catching menu. 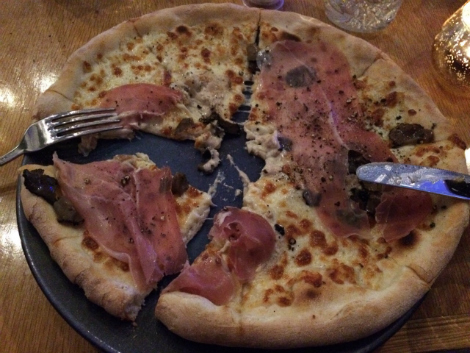 We opted for the restaurant’s signature pizza, an indulgent bianca topped with truffle and porcini mushrooms, customised with an added serving of Prosciutto. If it sounded a little rich on paper, the finished article was surprisingly well-balanced, packing a pleasing hit of truffle without allowing the ingredient to overpower (not always an easy feat to pull off). Intrigued to see whether the kitchen was as au fait with the traditional as it was with its own creations, we also ordered a Diavola, topped with the more workaday quartet of tomato, mozzarella, Nduja and fresh chilli. Happily, it worked just as well as its more luxurious counterpart, with plenty of heat from the Nduja and chilli, and a tomato sauce that, while not the punchiest, did its job well enough. 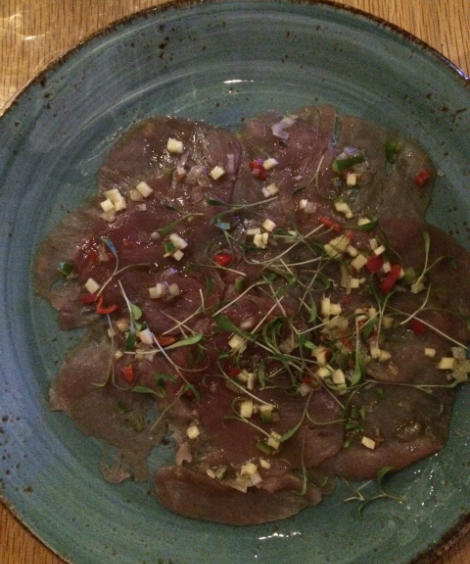 Away from the pizzas, we also enjoyed a starter of Salt & Pepper Squid in a light crisp batter and served with a saffron aioli (delish), and a perky Tuna Carpaccio, enlivened by a fiery chilli dressing. 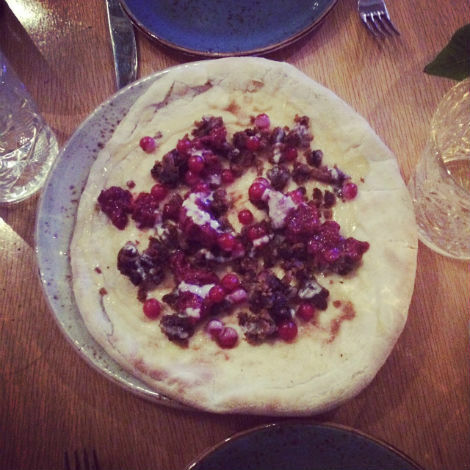 We also had the chance to sample the Christmas Pudding pizza, a seasonal special that (sadly) didn’t arrive flaming to the table, but was surprisingly tasty nonetheless. This entry was posted in Central London, Uncategorized and tagged Christmas, Luxury, Mayfair, Nduja, Pizza, Truffle by thelondonpizzablog. Bookmark the permalink. I do love a truffle on a pizza. Great blog post, I shall check this place out!